We are thrilled to present a piece by Project Y Playwrights Group Alumnus, Meron Langsner. Bystander 9/11 is a theatre piece concerning the events of September 11, 2001. 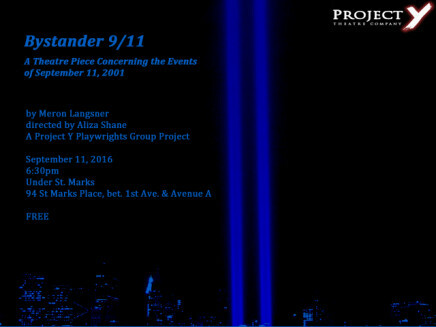 To mark the 15th anniversary of that unforgettable day, Project Y will present this piece on September 11, 2016 in New York City at Under St. Marks Theatre (94 St. Marks Place, bet. 1st Ave & Avenue A). 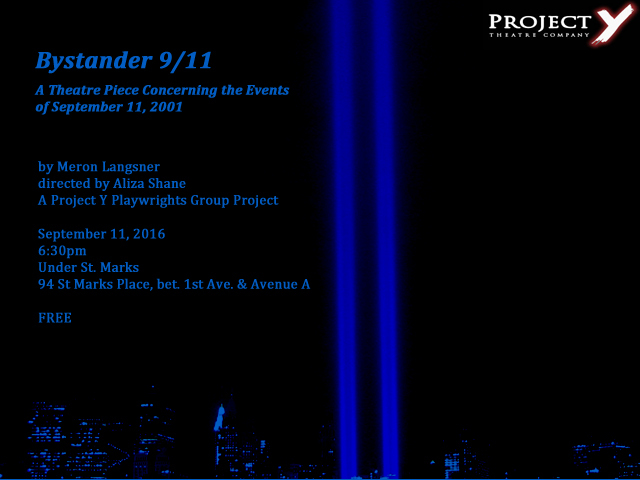 Bystander 9/11 by Meron Langsner, will be directed by frequent Project Y collaborator Alize Shane. Bystander 9/11 has been published in The Methuen Drama Anthology of Testimonial Plays. Seating is very limited. Please RSVP here. Meron Langsner was one of three writers in the country selected for the pilot year of the National New Play Network’s Emerging Playwright Residencies. His work has been performed around the country and overseas and developed at the Lark, New Repertory Theatre, KC/ACTF, and the Last Frontier Theatre Conference (where he returned as a Featured Artist). Publishers of his plays include Bloomsbury, Smith & Kraus, Applause Theatre Books, and YouthPLAYS. His work has been a Fringe “Best Bet” and Recommended Production and he has been a Best New Play nominee for the IRNE Awards in Boston. His articles on theatre have been published in peer-reviewed scholarly journals and both trade and popular publications including Backstage and HowlRound. Also a fight director, Meron has composed violence for over 150 productions, tours, and films in venues ranging from LORT houses to educational institutions. 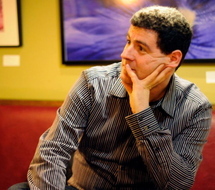 He holds an MA in Performance Studies from NYU/Tisch, and MFA in Playwrighting from Brandeis, and a PhD in Theatre History from Tufts University, where he received the Award for Outstanding Contributions to Undergraduate Education. Meron is a proud alum of Project Y’s Playwrights’ Group and a Core Faculty Member at the Tom Todoroff Conservatory. Aliza Shane is a director and playwright as well as the Co-Artistic Director of 3 Voices Theatre. Most recently, she wrote & directed Mein Uncle, an absurdist fairytale about the seeds of inhumanity. In addition, 3V has produced multiple staged reading events; for which Aliza has both written and directed. Aliza wrote & directed Are You There Zeus? It’s Me, Electra, (PCTF Awards), The Imaginary Invalid: By Prescription Only (PCTF Awards), The Spanish Wives: A Groovy Tale of Peace, Love and Restoration, and The Three Sillies, (NYIT Award). She is thrilled to be working with Project Y again and with Meron Langsner for the first time.